Add the look of sheer, delicate raindrops to your special event with our raindrop-shape beaded curtains from ShopWildThings. 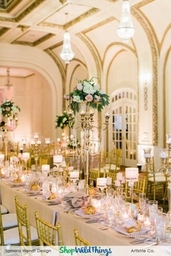 These ultra-fabulous raindrop beaded curtains with pearly iridescent or clear non-iridescent finishes are creating elegant settings for weddings, ballroom galas, stage sets and outdoor pavilion parties. 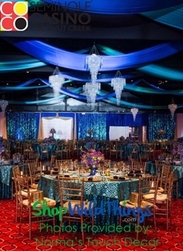 Used raindrop-shaped beaded curtains in doorways, as backdrops against walls, as space dividers or as dramatic flourishes suspended from ceilings. 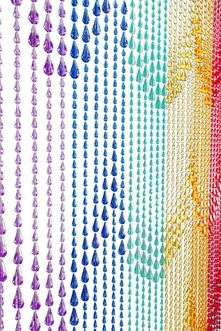 The beads graduate from small to large raindrop shapes to mimic the look of rainfall. They're absolutely stunning. 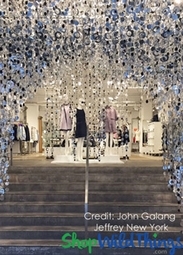 Each curtain has 45 strands of graduated sizes of raindrop beads. The width is 35 inches, and the length is 70 inches. The strands arrive already attached to the rod. To hang, simply insert nails or hook through two metal eyelets on each rod. For a beautiful touch, complement these curtains with our hanging raindrop-shaped glass candleholders. Chandelier Raindrops - Green Non-Iridescent 24"
Bag O' Beads Jumbo! 24' Strands of Yellow Gold Raindrops - 1,584 Feet! Choose from dozens of iridescent and non-iridescent color combinations. Solids include red, blue, silver, gold, pink, soft green, lime green and purple. Multiple-color combinations include Mardi Gras colors and our Rainbow edition. 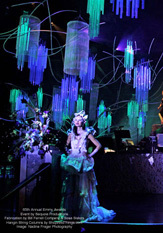 We also have Glow in the Dark beaded curtains with acrylic crystal raindrops. 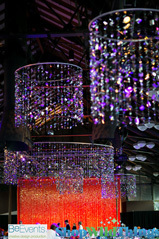 Fans have seen our Raindrops chandelier with raindrop-shaped acrylic crystal beads on the TLC channel's Sheer Dallas show. The diameter is 8.5 inches, and the length is 2 feet. 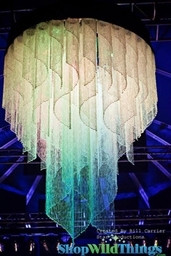 This chandelier comes with a U.L. light kit and 9-foot cord. Just add a standard-size light bulb. It's available in a non-iridescent, clear, pink or green style. Click on our video to watch how to install a light kit inside one of our chandeliers. Transform your bedroom with our Megan 3-piece bedroom set from our Room in a Box collection. This set includes a pink Megan canopy, a pink raindrops beaded curtain and a raindrops pink chandelier. Canopy mounting hardware is included for the bed canopy, which is crafted of premium poly netting fabric. Curtain dimensions 35" x 70"